We offer a wide range of custom made dining table in Sydney at very good price. We often use recycled hardwood or sustainably grown American oak. We can stain tables, dark wood, make black tables, round tables or oval tables. The top is made from 4 pieces of spotted gum and weighs more than 200KG. It is 40mm thick. I hand make every join. The frame is made using traditional pinned mortise and tenon joins. Each piece is jointed true by hand. The top is removable for moving house. A good table is central to years of meals, laughs and conversations, it's more than just a wooden surface. These pieces of Spotted Gum are reclaimed from rural bridge construction. $5200.00 ex GST. Delivery to Sydney metro included. Delivery outside of Sydney on request. There’s much to consider when choosing a dining table. After years of designing and making tables, we have learnt a thing or two. Often, a custom made dining table is a perfect solution to meet your needs. Have a think about this… Is the table going in a small room or large room? A large table can be at home is a small space provided the timber used for the top and for the legs is thin enough. A 25mm thick top is nice and thin, where as a 40mm top will give a very solid look. A clever trick we use is to chamfer the underside of the edge to 65 degrees. At that angle, one will only see the thin exposed edge and not the full thickness of the top. Think of it as a secret strength to the structure. Another thing that set our tables apart is the attention to detail. It’s the detail that makes your dining table a delight to live with. For example, you’ll find that you naturally rest your forearms on the edge of a dining table. So we spend a little extra time on the edge and corners of the table to make them smooth and comfortable for your arms to rest on. 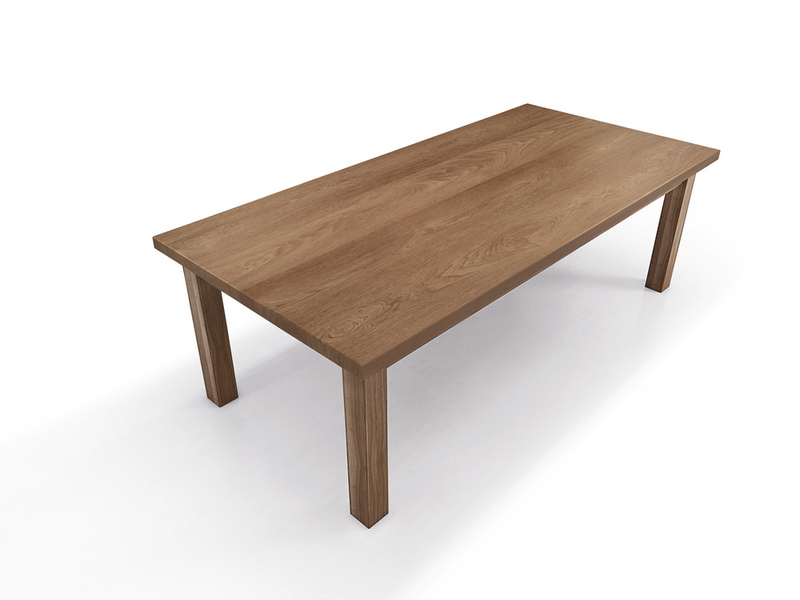 The height of our tables can easily be changed but between 700 and 720mm gives a really nice casual feel. It will also be comfortable with a standard height chair at 460mm. Lastly the placement of the legs is important to fitting everyone in evenly. We give each place setting600mm. You’ll find we place legs of an eight seater 1800mm apart. This allows three people each side and two heads. A ten seater can be made with the same size base and a longer overhang on each end. The shape of the shape of the room also weighs in heavily. Perhaps a square table or a large round table top would suit you better. If you like to eat banquette style meals with share plates down the middle of the table, a slightly wider rectangle table will be ideal. 1100mm wide allows room for standard dinner plates and still leave space for large platters between them. Dining Tables in Sydney are often influenced by the architecture of the city. Square or round tables fit in exceptionally well with apartment living. Especially in Deco Sydney apartments where the rooms are rarely long and thin. We notice a large proportion of our dining tables in Sydney are round and square tables.